John Jorgenson Quintet creates a unique musical experience that equally enthralls the most discerning and the casual music fan. The ensemble was originally formed in 2004 for the release of "Franco-American Swing". 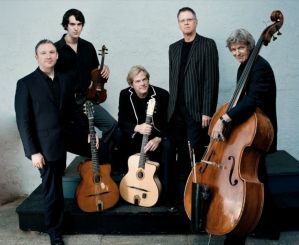 The group’s style has been called “Gypsy Jazz” after the dynamic string-driven swing created by Django Reinhardt and Stephane Grappelli in 1930s Paris, but Jorgenson’s compositions draw in elements from Latin, Romanian, Classical, Rock and Greek music, so “21st Century World Music” is perhaps a more apt description. The John Jorgenson Quintet is the only American act to ever headline the prestigious Django Reinhardt Memorial Festival in France, and has been featured at other “Djangofests” in the US, UK, Germany and Canada. For the films Gattica and Head in the Clouds Jorgenson was tapped to recreate Django’s music, and in the latter he even appeared onscreen as Django with stars Charlize Theron and Penelope Cruz. Jason Anick is a prodigious jazz violinist and one of the youngest instructors at Boston’s Berklee College of Music, Anick is considered “a rising star in the world of jazz violin and mandolin” according to Downbeat Magazine. In addition to leading his own contemporary jazz ensemble and performing with the Rhythm Future Quartet, Anick has also shared the stage with an array of artists like Stevie Wonder, Tommy Emmanuel, The Jim Kweskin Jug Band, John Sebastian, Delta Rae, and Girls, Guns and Glory. Max O'Rourke is a composer, arranger, and jazz guitarist 19 year old and the winner of the 2015 Saga Djangofest Award for outstanding young musicianship in the genre of gypsy jazz. Max performs the music of Django Reinhardt, Gonzalo Bergara, Biréli Lagrène, Cole Porter, and others, in addition to his own compositions. Simon Planting is a dutch bassist well-known and respected in the gypsy-jazz community from his tenure, joined John Jorgenson Quintet in 2009. He performed in concerts and festivals around the world compiling an impressive discography with artists like Mathilde Santing, Fapy Lafertin, Jimmy Rosenberg, Stephane Wrembel, as well as several Gypsy Jazz tributes and compilations. Simon also toured in a band with his former classmate Reiner Voet of the Gypsy Jazz duo Pigalle 44. Rick Reed is a veteran percussionist, renowned for his intricate brushwork and swinging drive, received a "Best Drummer of the Year" nomination at the Martin Reggae Music Awards. His natural talent and dedication led him to collaborations and numerous endorsements throughout the years including Zildjian, DW “Drums in” and grammy winner Shelby Lynne, who chose him for her "Tears, Lies and Alibis" album. Rick has also performed and recorded with award-winning banjo player Alison Brown, blues/slide guitar master Rick Vito, Ray Davies of the Kinks, Jennifer Niceley, UK singer-songwriter Clive Gregson, and Leslie Tucker.